The proposed multibillion-dollar natural gas pipeline from the North Slope took a step forward this afternoon with the receipt of bids from potential shippers. “The Alaska Pipeline Project can report that we’ve received multiple bids from major industry players and others for significant volumes,” said Tony Palmer, TransCanada Corp.’s vice president for Alaska projects, reading from a prepared statement. He declined to deviate from his text. 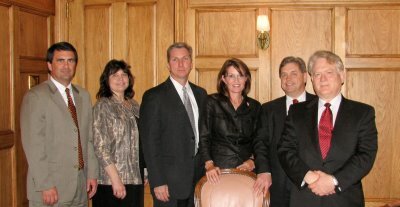 One of Governor Palin’s signature issues while Alaska’s chief executive was the AGIA pipeline project. Yesterday, in another major step forward, TransCanada, the huge multinational pipeline company who is partnering with ExxonMobil to put the plan into effect, formally filed their open-season plan to seek natural gas commitments for the multi-billion dollar project. This is big news. The state of Alaska has been trying to get this project off the ground for decades. However, the project has been unable to advance due to a toxic combination of weak political leadership, corruption, and spectacular incompetence in Alaska’s legislative and executive branches. This changed dramatically with the gubernatorial election of 2006 and ever since Governor Palin and her team developed the AGIA plan the project has been moving inexorably forward. However, roadblocks were erected. For example, I wrote about Rep. Mike Hawker’s barricade here, and R.A. Mansour wrote about Rep. Jay Ramras’s opposition here. Let’s not forget, while we’re at it, President Obama’s apparent desire to step in and take credit for it here. Now it looks like we’re really moving ahead with this all-important, much-needed, long overdue project into which Governor Palin poured herself. This is a cause of celebration–again, not just for Alaska, but for the entire nation. That this project has progressed this far is a testament to the commitment Governor Palin and the pipeline team she assembled made on behalf of the citizens of Alaska. Indeed the entire country will benefit from this project as it will help move America in the direction of energy independence, despite the best foot-dragging efforts of the Obama Administration to continue our reliance on foreign sources of energy or unproven “green energy” schemes. Whitney Pitcher has more on this success here.